Social Media began as a means for people to share status updates and connect with friends and family. It didn’t have a business element to it, nor was it a tool used for marketing purposes. Now, things have changed. Facebook, Twitter, Google+, and all of the other major platforms are now a blogger’s bread and butter. If you want to promote your content and increase your traffic numbers, you need to put your posts out there, and social media is the way. Of course, just posting constantly on random platforms isn’t the right way either. There’s a finesse to it. 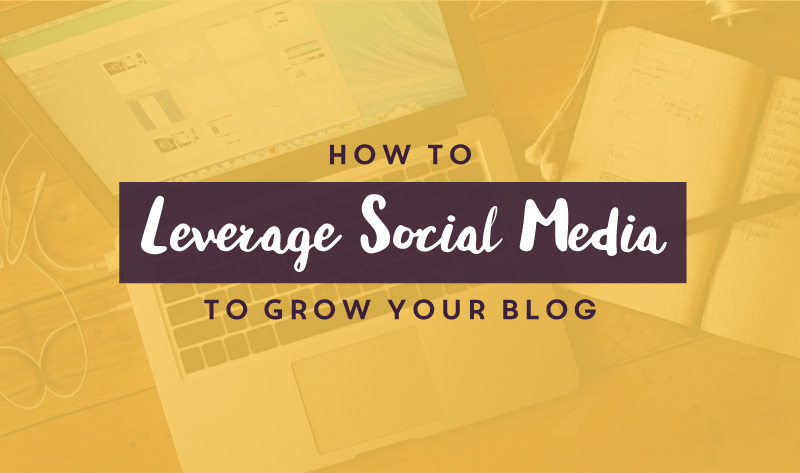 Today I’ll show you some creative and proven ways to leverage social media as a tool for growing your blog. Not only will this type of content marketing improve your traffic numbers, but it will also improve your profits when you start bringing in leads that turn into conversions. Check out these five tips and you’ll be well on your way to understanding the power of social media for bloggers. He’s absolutely right. Another great tip is to use photos that catch the eye, since tweets tend to fly by when someone is checking out their feed. A great photo can stop them in their tracks and force them to take a look. The same goes with Facebook feeds as well. The last key element here is writing content that appeals to your audience. Remember your readers, promote the right content in the right places so it gets seen by them specifically. Let’s explore how to do that next. Even though Facebook has millions of users, your audience may not primarily use it. Instead of just hoping for the best, you should seek out the places where your audience lives online. This way you’re bringing the content to the right people at the right time. As the saying goes, you’ll catch more flies (followers in this case) with honey instead of vinegar. If you want your blog to explode, you need to bring in the right people. Without pouring time (and money) into research, the easiest way to find out where your audience is, at a basic level, is to either ask them or visit the platforms yourself. Find your niche on Facebook, Twitter, and even LinkedIn, and if there’s a strong presence of people discussing topics that you also discuss, then you’ve found the perfect place to start promoting your content. Look for your audience on Twitter, Facebook, Google+ and LinkedIn. Promote your content in places where you see them (it could be one, or all!). Check out where other people are sharing content on your competitor’s blogs. Using a simple tool like Google Analytics, or any other similar tracking tool, can show you where your visitors are coming from. This is an incredibly valuable category of information as it shows you where your audience is finding you. You may be surprised to see that they are coming from LinkedIn instead of Twitter or Facebook. If this is the case, then you know where to shift your focus to maximize results. For Twitter: Use the almighty hashtag to ensure that your tweets are seen by the right people. You may find yourself posting on multiple platforms and tearing your hair out trying to remember which platforms should receive which posts. It can be confusing and difficult to handle all of your posts at once, so instead of trying to be superblogger, use a tool like buffer. This tool allows you to create and schedule posts on all of your social media platforms. Not only that, but you can schedule them up to a week in advance! This cuts out a lot of stress and time, so you can focus on promoting your content to the right people, and in the right places. Last, but certainly not least, is bringing the practice full circle. You’re only one person, so sharing your content is important, but getting others to do it for you is the real victory. With a simple WordPress plugin of your choice, you can place buttons on each of your posts that allow your readers to instantly share that content on their social media profiles. Putting the power in your reader’s hands is how you truly elevate your social media presence and create the growth you’re looking for. Social media is a gold mine for bloggers to promote their posts and drive visitors to their blog. They key lies in reaching out to the right people, at the right time, and in the right places. With this tips in mind, you’ll be able to do just that. Thanks for reading and be sure to share your own thoughts and tips in the comments below! This is a guest contribution from Matt Banner of Onblastblog.